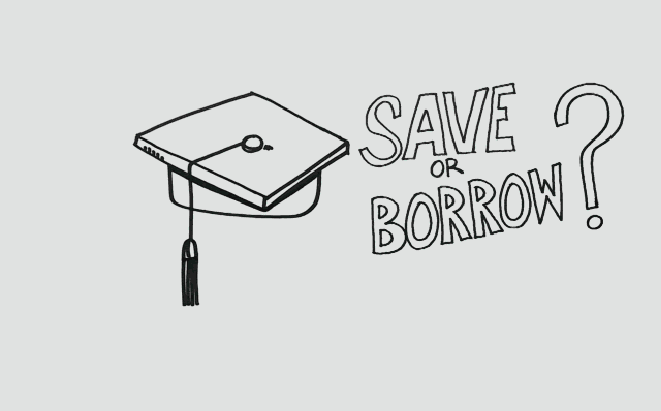 When it comes to paying for higher education, should you save, or borrow? Meet Sue. When Sue was born, her family started investing in a 529 college savings account. Sue's family contributed $100 a month for 18 years, for a total of $21,600. With a 5% annual rate of return, their account earned an additional $13,400—for a total of $35,000, that Sue can use for qualified higher-education expenses like tuition, room and board, and school supplies. Meet Brian. Brian is 18 years old, and he's borrowing some of the money he needs to pay for college. Brian is getting a private student loan for $35,000, with a 7% annual interest rate. If Brian pays off his loan making monthly payments of $406, for 10 years, his $35,000 loan will cost him over $48,000. Sue's out-of-pocket cost is $21,600. Brian's out-of-pocket cost is $48,720. You can't put a price tag on the educational experiences Sue and Brian will have—but you can see the value of saving versus borrowing. While it may not be possible for you to save as much as Sue's family, any amount you save will help to offset the amount your child has to borrow. Save now, so the only things that stay with your child after graduation are lessons learned and memories made—not debt.